What data can you access with Visual Intelligence? SAP Visual Intelligence can access business data from multiple sources such as MS Excel, C.S.V Files, Freehand SQL, SAP HANA Cubes, and SAP BusinessObjects Universe. When we look at these data sources, we see that they can be split between two major types of users. The first is the traditional Enterprise user who has a data warehouse running on SAP HANA or Relational Databases; and using SAP BusinessObjects Universe Semantic Layer, SAP BusinessObjects Web Intelligence, SAP Crystal Reports, or even SAP BusinessObjects Explorer for reporting. The second major type of user is a small business with few employees and a small IT department where the business owners or employees need to be able to create their own visual graphic solutions using their business data. What needs does Visual Intelligence Address? One is the ability for the end-user to define the content and scope of information going into the visualizations and thereby reducing or removing the need for non reporting data to be added into the file. Second is to provide the end-user with an interactive tool which is easy to navigate and easy to use to build charts. Here the end-user can be the power user who can develop their own visualizations and quickly train their staff to develop. Third is deliverance complexity. SAP Visualizationssolves this with a few simple clicks.Once the user is satisfied with their charts, they can simply save it and share it through email, embed the chart in Office documents, and also make them available for presentations. Sharing between multiple systems is also possible.Datasets on which visualizations are created can be saved and exported to CMS Enterprise Server and can be used as information space sources using SAP BusinessObjects Explorer to build Explorations. They can be accessed from iPad using SBO Explorer App. In addition, documents can be published to SAP Streamwork and datasets can also be exported to SAP HANA system. How does Visual Intelligence Work? SAP Visual Intelligence is designed to create an experience where the process of development of visualizations is reduced to a few steps. It targets users who are experienced with their business content and is designed with a well-defined target development interface which is not overwhelming and covers all features in one prepare pane window with just four main development panes (Visualizations, Data, Semantic, Manipulation Tools) and one share pane to deliver the reports. The process cycle includes selecting a data source, preview the data before acquisition, once acquired, allow formatting and creation of calculated measures, if needed cleanse raw data if required for business meanings, and apply these objects to different charts to produce visualizations, and finally allow users to create multiple visualizations save them and share them to the appropriate user community. In short for folks like investment analysts and those in middle management or business managers who typically use and rely on reporting needs day in day out and know their data points, this tool is a good option to allow them to create their own visualizations quickly. It not only gives them the opportunity to create, but it can help them analyze data and find any abnormalities in underlying data which can then be addressed by IT. SAP Visual Intelligence also allows hierarchical data to be defined for time and geography based column data. This allows end users to quickly produce yearly, quarterly, monthly, and date level aggregated detailed sales figures for their products and services. Geography based hierarchies allow end users to take objects like country, state, and city data including longitude and latitude data, from the dataset and allow SAP Visual Intelligence to use this information to map it to its internal Geography database and create hierarchical attributes which then can used in geography type charts to view performance in maps across all regions. SAP Visual Intelligence inherits features from most of the current BusinessObjects Enterprise tools. It has crisp graphics like XCelsius and it has the ability to connect to Universes which typically were once native to SAP BusinessObjects Web Intelligence. Datasets created in SAP Visual Intelligence can be used as information spaces for SAP BusinessObjects Explorer. 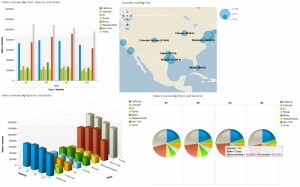 The traditional SAP legacy system users now have the option to use SAP Web Intelligence for full client reporting for BEx Queries and SAP HANA Data (as this database replaces underlying systems for SAP Business Warehouse), SAP Visual Intelligence provides them an easier step in creating visualizations based on their data and a parallel subset reporting application which can be focused for presenting specific datasets which are candidates for charting visualizations. Such scoping and analysis helps to identify sources which can be used to create visualizations quickly rather than waiting for a developer to complete reporting using full client tools. In conclusion, this product can be used to access data from multiple data sources and share deliverables to users easily, it interacts with other systems to share data, and acts as a good alternative for business and management end users, who can act as data stewards to control, access, build and present visualizations and share them with their peers in a very quick and convenient manner without the need for traditional IT development resources which can save time and cost. SAP Visual Intelligence may be a good choice for those who need to have high quality charts and graphs as part of their business intelligence. Thanks for posting.